You’ve heard it before: Flying coach is only going to get tighter and more uncomfortable. While airlines are spending money on making spacious, luxurious cabins up front, the game in the back is called, “How many more seats can we squeeze in?” For the future of economy travel will feel more confined than comfortable. Most of the innovation in economy class seats has to do with figuring out how to redesign them in order to fit more in the same cabin. Legroom has already decreased so much, it has become a safety concern; the U.S. Department of Transportation’s Advisory Committee for Aviation Consumer Protection recently addressed whether less legroom could inhibit evacuation plans. Julie Frederick, representing the Association of Professional Flight Attendants, told the Advisory Committee that less legroom has led to increase fights among passengers, forcing planes to make emergency landings. Besides getting closer together, the seat themselves are getting thinner, lighter, and less comfortable. While products like Panasonic Avionics and B/E Aerospace’s Jazz Seat (a finalist for a 2015 Crystal Cabin Award, the “Oscars” of cabin interior concepts) are designed to enhance the passenger experience by using technology and other creature comforts, they won’t actually improve body comfort. That may be fine for a two-hour flight, but imagine flying cross-country or internationally. It’s not all doom and gloom: Some seat-makers are coming up with concepts that try to meet the needs of airliners, while improving the economy passenger experience. Unfortunately, as concepts, they may never make it into an actual plane. Here, we look at some of those concepts – good and bad – as well as a few actual products that are being implemented. Airbus has filed plenty of patents that make the economy cabin frightful, like fold-down bicycle-style seats that look horribly uncomfortable. Most of those patents are just concepts, but here’s one that’s real, and could show up some day. At the Aircraft Interiors Expo in Hamburg, Germany, back in April, Airbus demonstrated what we thought was impossible: squeezing in one more seat into an already cramped economy cabin. 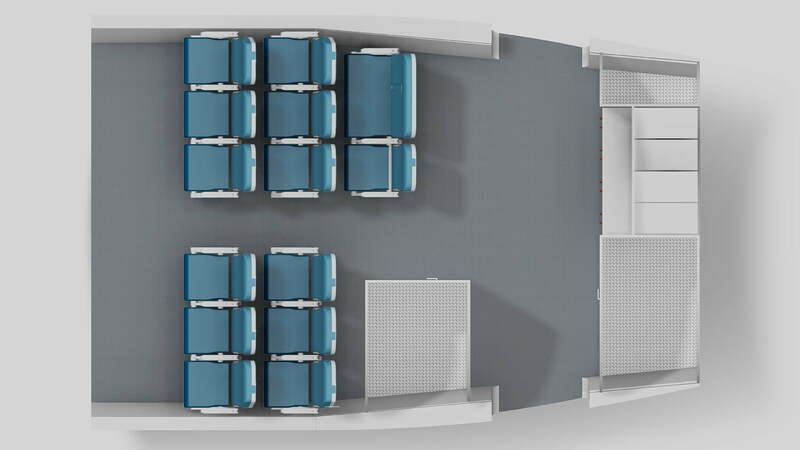 Its new 11-seat Budget Economy concept changes the seating configuration of an Airbus A380 (its double-decker jumbo) from 3-4-3 to 3-5-3, creating a new middle seat. 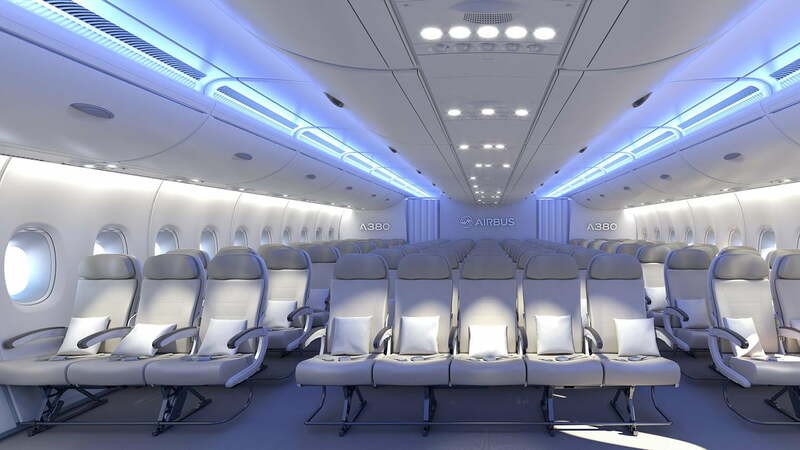 Airbus says the configuration keeps the 18-inch width (it achieved this by moving up the window seats and making armrests and aisles smaller), while allowing airlines to increase the plane’s capacity – possibly offering a lower-priced option for budget fliers. Not only could this make the economy cabin feel even more claustrophobic, it’s also happening in planes that typically fly for longer than 10 hours. As Runway Girl Network points out, it is “a downgrade from the passenger experience point of view … a pretty dire experience for the window passenger in particular.” So far, it’s just a concept. Plus-size passengers or those with kids will either praise this chair concept, or point to it as another example of inequality. 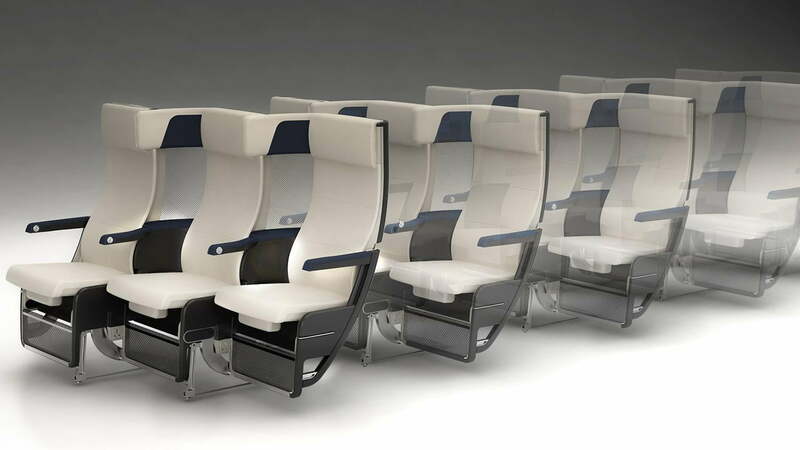 SII Deutschland, a German manufacturer, took home a Crystal Cabin Award at the 2015 Aircraft Interiors Expo for its SANTO seat, which is short for “Special Accommodation Needs for Toddlers and Oversized” passengers. There’s no confusion for which passenger this seat is designed for. The SANTO is much wider than the standard coach seat, enough to accommodate a baby seat and parent. But it also allows plus-sized passengers to sit in more comfort, without having to pay for an extra seat. The SANTO is designed to fit at the back of the plane, where the fuselage narrows. So, on one hand, it’s a unique solution for passengers who could use the extra room, but it forces them to the back of the plane. Whether it’s a benefit, depends on your point of view. For regular customers, it could be that La-Z-Boy in the sky that’s worth heading to the back for. On its international Boeing 777-300 and 787-8 aircrafts, Air New Zealand’s economy seats can convert into what the airlines calls the Skycouch. Spread across three seats, the leg rests fold up 90 degrees to create room for a couple to sleep. At 61 inches, it’s not a lot of room for average-height adults, but it’s an affordable alternative to premium economy or business class. Unfortunately, Skycouch is only accessible if you purchase all three seats. Air New Zealand has also licensed the concept to Taiwan’s China Airlines, which branded it the Family Couch. When it comes to no-frills airlines, we don’t expect much in terms of amenities. But Southwest works at keeping prices low while offering passengers some comfort – at least in its marketing. 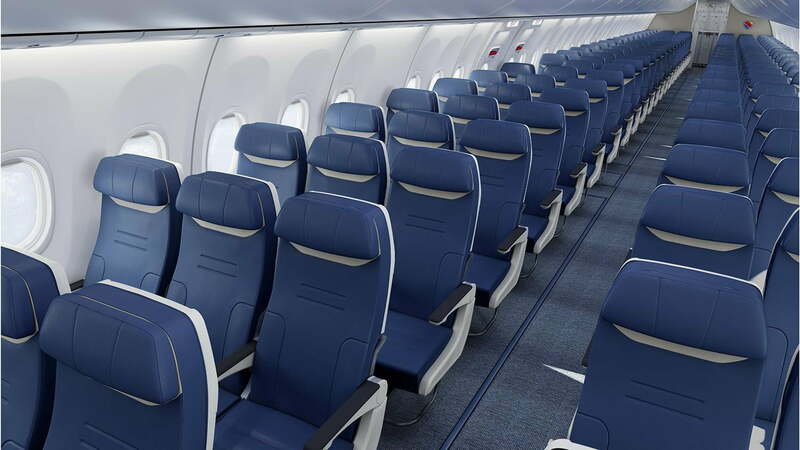 When the airline takes possession of new Boeing 737-800 and 737 MAX planes, they will come installed with new B/E Aerospace seats with slightly more width, and more room below to put their feet back, thanks to a new design that involves thinner armrests. 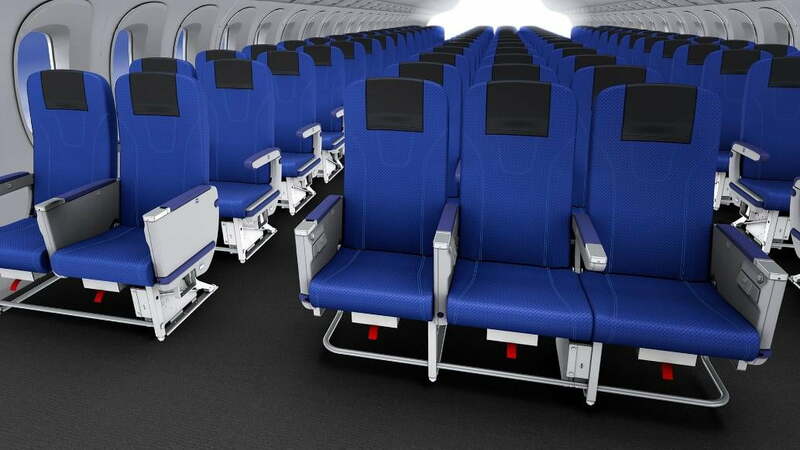 Southwest says the seats are also lighter, which helps a plane burn less fuel, and are upholstered in an eco-friendly material; there’s no word, however, if the pitch (legroom) will be reduced. The seats are expected to enter service in 2016, but observers are already skeptical. Besides simply being too small, economy seats often force the body into an unnatural position. Japan’s All Nippon Airways is launching a new seat from Toyota Boshoku in June that’s “ergonomically developed for comfort across a wide range of body sizes and types,” ANA says. The seat firmly supports the pelvis, which limits muscle fatigue in the hip area and gives the body a relaxed posture. The seat’s height, length, and angle distribute body pressure evenly for increased comfort. Tray tables and armrests are also positioned for better ergonomics. Part of the Toyota Group, the seat marks Toyota Boshoku’s entry into aircraft seat manufacturing, but the company has experience in developing seats for tight spaces, like race cars. The seats are being introduced into domestic flights in Japan; if it’s as comfortable as ANA claims, we hope to see it in long-haul flights. Thompson Aero Seating’s Cozy Suite is an example of great out-of-box thinking, and that not all ways to pack in more seats are awful. Instead of the common straight-line configuration, it uses a staggered system, like the ones in some business-class cabins. This could increase seats in planes, while upping the passenger experience. Tray tables are larger, seats push up for easier entry and exit, and their hard-shell backs won’t recline into the person behind you (seats move forward instead). The design also gives a sense of privacy, and the headrest is great for those who like to sleep on planes. Although Delta Air Lines once said it would put the seats into service, it seems it has abandoned the plan. Thompson Aero is still selling the seats, but so far no airline has ordered them. Paperclip Design is a Hong Kong-based firm that has been recognized for its concepts. Its Checkerboard Convertible Seating System allows airlines to transform seats from economy to premium economy or short-haul business class by simply folding down the entire seat backs, turning it into a giant tray table and giving the cabin an illusion of bigger, more private space. But a Paperclip innovation we would love to see is its Meerkat concept. The design, made for international travel, deals with an airline’s need for more lighter, slimmer seats, without sacrificing comfort. The seats recline without intruding into the space of the person behind you; under-seat storage is below your seat cushion, rather than the space underneath the seat in front (giving you more leg room); a unique armrest lets you and your neighbor both spread your arms out, while a special hook keeps headphones accessible; and a tray table opens half-way to double as a stand for your phones, tablets, or books. Plus, there’s plenty of storage.